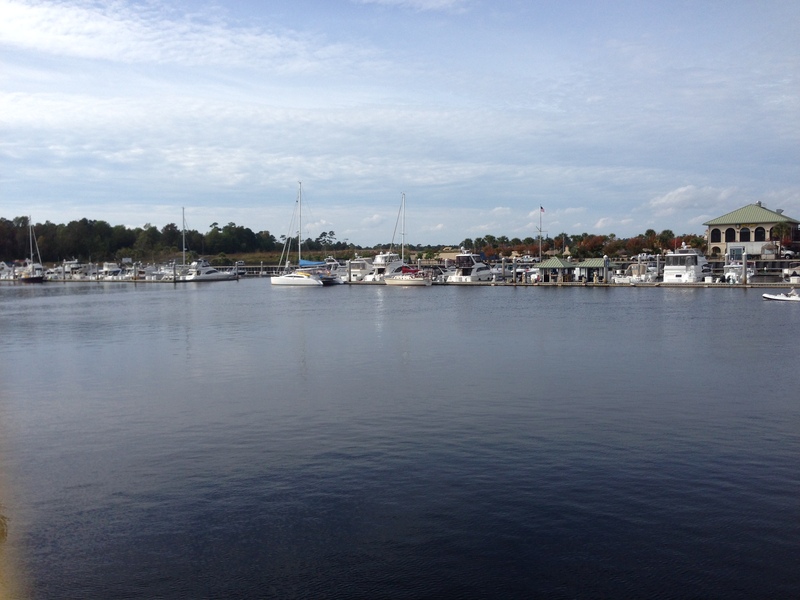 Back on Oct 25 in Manteo we’d decided to move along based on a cold front forecast to arrive around today- give or take. At one point winds were to be 20-25kts and measurable rain would be dumped upon us. Between Southport and our next safe haven marina, Barefoot Marina in N. Myrtle Beach lay two badly shoaled sections at inlets Lockwoods Folly and Shallote and the very skinny three-mile long Rockpile section. Windy wasn’t so much a problem as rain that would mess up visibility. Our greatest wind concern was the predicted clocking around that seems to occur mostly at night and then the anchor as to re-set… or not! The plan on Thursday was to leave Southport mid-morning and transit across the inlets on a rising tide, two hours or more past low. Anchor in Calabash Creek (a short day) then Friday would be the Rockpile, ending up a couple of miles later at the marina. When Thursday arrived with a revised Friday forecast not to our liking, we opted to leave early, transit the inlet sections before low tide and arrive at Barefoot Marina shoeless, I mean by 2pm. This would allow us a chance to walk across to Barefoot Landing, a complex of shops, restaurants and attractions before the rain arrived. Most times we have no help leaving a dock so Russ removes the spring line and loops the bow and stern back to the boat so I can simply pull them through at his signal. I don’t try to flick them off the cleat because the one time I tried, I managed to get the line looped extra around one end of the cleat- so forget that. The wind was light and blowing us gently off the dock. I pulled the bow line and went to the stern. As I pulled the line I could see a knot forming at the bitter end of the line. Nooooooooo- it would get stuck between the cleat and the dock- yep sure enough, so I release the line from the boat cleat and toss it back toward the dock. I make my mad face and Russ says we’ll retrieve it. Just then a guy walks by, I ask him to gather our line and toss it as we get back closer to the dock. Ok, this is the second time we almost lost a line; this keeps up Russ won’t ever want to dock again. Note to selves; be sure line is not twisted or ready to knot itself. A boater has many resources available to help navigate and provide current intel about waterways, bridges, marinas and the like. We use ActiveCaptain which can be almost real-time if you update it frequently. This trip we also began checking the Salty SE Cruisers’ Net online. (cruisersnet.net) The most current info can be obtained from hearing what others relate on the VHF as they pass by and through difficult sections or under bridges. Today’s terrors have been dredged, the floating buoys moved frequently and still they become a regular problem at mid-tide and lower. Quite a few boats were ahead of us, monohulls and trawlers so we’d knew the early warning system would be in place. We lowered the daggerboards to be one foot below the rudders/props; now we’d draw nearly four and a half feet. Our depth sounder is near the bottom of our starboard hull. Our port daggerboard never moved up and down smoothly; now it does. We’ve never gone aground in mid-channel; now we have- twice. Once with both hulls. Fortunately it was only sand and raising the boards got us off. The second time was the worst; I ran up to check depths with the boat hook and found less than one foot next to the starboard hull at the bow. We’ve heard that barges come through and dislodge the sand in an ever-changing depth configuration that makes transit at any time lower than mid-tide, a huge problem. The first time, the board made this strange scraping sound; Russ didn’t know what it was at first. Which way to go? We sat between the red and the green. Oh wait, the starboard (red side) hull isn’t stuck, it’s the port hull where we don’t know the depth. Ah, so we discover an ugly downside to two hulls sitting 20ft apart. The Rockpile section was a cake walk after this poor catamaran behavior. But if you were counting, you’d know that all would be well, right? After the third “trick” (the line and two groundings) the rule of threes was satisfied. Darn good thing; my poor frayed nerves. This entry was posted in Uncategorized and tagged Hair raisers. Bookmark the permalink.